This depends on your pets, of course. Some animals hit it off right away, others not so much. To avoid territorial disputes right off the bat, it may be wise to leave your dog at a friend’s house until your new kitty is familiar with their new home. Cats love high places, spots to nap, and a little bit of space to themselves. Leaving a shelf empty for them, getting a new cat bed or just placing their food in one of the low-traffic areas of the home can be a big help. As they explore their new home, they’ll want a comforting presence so they don’t get spooked. You don’t want to drop the cat off and then take off for work. Wait until you have time to show them around before bringing them home. Make sure that your favorite vase isn’t sitting precariously on the edge of a shelf. Some homes are like a house of cards to a cat, and you need to ensure that you’re not leaving them with a playground of fun things to break. Give them their own scratching post and toys to keep them from wanting to scratch up your curtains. More than anything, it simply takes time for a cat to get comfortable in new surroundings. 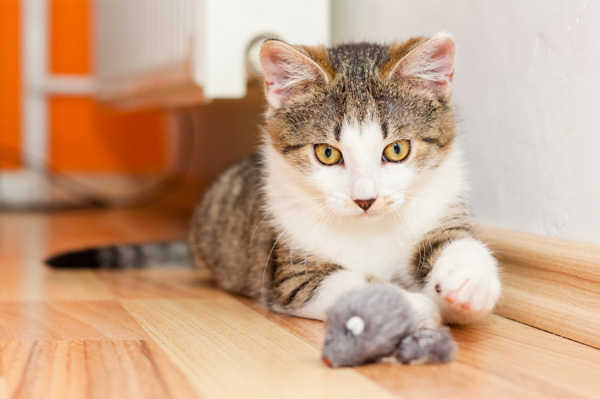 Be patient with your new feline friend and they’ll grow accustomed to their new home.